Well well well, what do we have here? 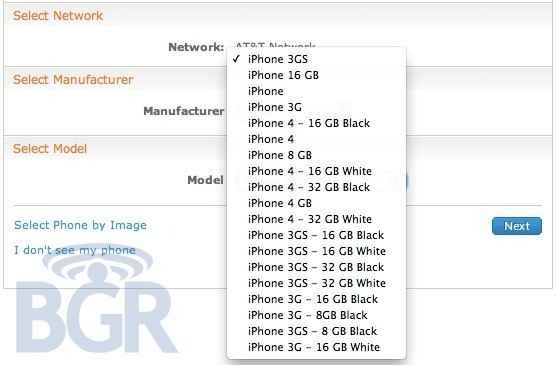 Boy Genius Report are, err, reporting that the fabled white iPhone is showing up in AT&T’s Online Account Management system. If that wasn’t enough, it seems the same white handset is also showing up on the sites of both Orange UK and Three. Things are starting to get interesting! No date for expected arrival is given, but this does open up the white iPhone rumors once again. BGR speculates a late February or early March release, which pushes us closer and closer to the iPhone 5. Will Apple even bother with a white iPhone 4 at this point? Maybe the iPhone 5 will break from the usual 12 month release cycle? As with all things Apple, time will indeed tell. Watch this space folks! uｎｌｏｃｋing phones got easy theese days, but not to screw up your phone and got it barred became much harder.My father after he have bought his new iphone 6 was locked back by the carrier and got iphone bricked. If you want to uｎｌｏｃｋ your phone, you need to find the most professional uｎｌｏｃｋ team, like ATTIPHONEuｎｌｏｃｋING or my#imeiuｎｌｏｃｋ. I know the best site for սոⅼοсking AT&T phones, it’s just google atttiphoneuunloockiing, if you have phones l0cked to AT&T, go check it out, we have the electricity to ՍΝᏞΟᏟΚing the newest 6S and 6C as well.